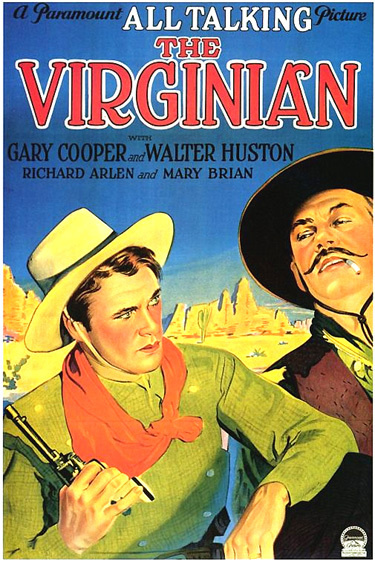 The Virginian (1929) is a classic western - a film adaptation of Owen Wister's 1902 western play and original novel. A Wyoming ranch hand foreman, the Virginian (Gary Cooper), confronts a band of outlaw cowboys, who are rustling cattle from his herd and changing brands. Catching some of the gang redhanded, the Virginian sees to their lynching. However, the villainous leader of the gang, Trampas (Walter Huston), is still free. The film comes to a final climactic showdown in a shoot-out on a dusty western street between Trampas and the Virginian. Trampas is shot down by the Virginian's fast-drawn gun. Trampas: Who's talkin' to you? Virginian: I'm talkin' to you, Trampas. Virginian: (drawing his gun) If you wanna call me that, smile. Trampas: (long pause, followed by a grin) With a gun against my belly, I-I always smile.